Hi everyone DJSorad, Orwiggle, and Samscbw have teamed up to run multiple contests this year. We will range from giving away newly released games, gift cards, consoles, and PC components. 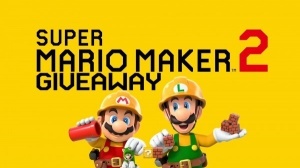 After the success of our Anthem Giveaway, we are back and this time we are giving away a Super Mario Maker 2 Switch Bundle! A second switch bundle may be added depending on the amount of entrants so as to increase your chances of winning. Thanks for entering and good luck!! !